When hybrid pickups were tested a few years back, nobody seemed to know about them. The Silverado 1500 hybrid and F-150 hybrid were taken out of production around 2013. It appears that, since then, manufacturers have focused on producing lighter-weight trucks instead of trucks with alternative fuel sources. But it feels like consumers are getting sick of driving Priuses to save money and protect the environment. We want options and manufacturers have taken note. Soon, there will be more fuel-type variety than ever before. And we’ll be seeing some interesting new designs, as well. Rumors abound about what Ram’s next pickup will be. There’s no small pickup in the Dodge product line, nor is there one in the Ram line. There must be one coming. 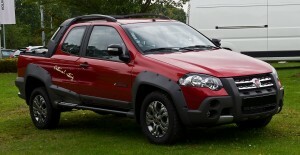 Many suspect it will be something like the Fiat Strada. In fact, pickuptrucks.com spied something that looks a lot like the Strada while it was being tested. We can expect this vehicle to be inexpensive because it’s small and it’s a Ram. Car and Driver reports that the Rampage will probably have a small turbocharged engine and have an asking price of around $17,000. There’s nothing quite like it in the US now. Nobody knows if it will actually look like the Strada or when it will hit showrooms. Not to be outdone by Ford, Chevrolet and GMC are producing new hybrids with “eAssist” in order to test them in the market. We suppose it would be too risky to produce them on a large scale, since we don’t know how well diesel trucks will sell. Typical truck drivers aren’t necessarily crying for new hybrid models. Yet, they are here again. The only thing is, we can’t select the hybrid engine at gmc.com, when we “build” a truck. Looks like the hybrid quota may have been met already. GM is testing the waters, at least. NPR broke the news in an interview with Ford’s CEO back in December that the company was working on a conventional hybrid F-150. The company plans on spending 4.5 billion on electric vehicle development over the next five years, according to Autoblog. It should be no surprise that even trucks are being developed. Motor Trend said they noticed a charging port on an F-150 as it was being test driven. They expect a plug-in hybrid F-150 by 2020. Autoblog also spotted a new F-150. It was producing that unmistakable diesel noise in Michigan back in December. It had a Venturi exhaust tip, typical of Jaguar Land Rover diesel engines. If Ford decided to offer an F-150 with a Land Rover diesel V6 and aluminum parts, it would be a quality alternative to GM’s diesel options. Ready to get quotes for you next truck? Just request them online, from all of your local dealerships. Show your offers to competing dealers and find out if they can beat the best one. Click here for free, no-obligation quotes from BuyingAdvice.com.